So, I won a trip on twitter. From Belk, to enjoy the Belk Bowl. Yeah, I'm having FUN! It started out horrible as there was some very loud people across the hall at our hotel that woke me up at 0230. I couldn't get back to sleep. Around 1000 Mike and I decided to head to the stadium for our adventures. And, boy did we have fun. Without further adieu I will show you a lot of pics that I took and update more later. BUT, first...I would like to say "HI" to all my new followers!! HIYAS! And, second...there will be a more detailed post coming this week. This is how our day started. Such wonderful people at this hotel! Mike and I (along with Belkie) in the lobby of the hotel! Mike and Belkie in front of the fountain outside the hotel. One of Charlotte's police officers was kind enough to pose with Belkie. Inside the tunnel getting ready to go ON THE FIELD! We were this close to the football players during pregame! Yes, I had to get this pic! Just too coolies! Oh, I soooo told Mike that I was putting this one on my blog. He actually had a GREAT time and posed for a lot of pictures. I'm so proud of my husband! Belkie was having so much fun! We don't get too many good pictures of us, and I LOVE this one! I ran into both of the Mister's Belk on the field! They're awesome people! This wonderful lady sang the National Anthem beautifully! After a VERY long day, we're back at the hotel relaxing. There will be another post of the adventures of Belkie, because he had a great time also. I want to say a special Thank You to all the wonderful people at Belk for this trip. Especially Ruthie, Tigi and April. Also, the wonderful staff at The Westin Charlotte for exceptional service. I Still Believe in Good People! OK, I'm scatterbrained. I have scatterbrained friends. I have a scatterbrained husband...well...his is because of his TBI, but that's another story! Anyway, one of my incredibly scatterbrained friends did something, well, scatterbrained, the other day. She LEFT her iPad at McDonald's! And, thank goodness for honest people. Needless to say, she got her iPad back, and the gentleman that found her iPad is an angel. 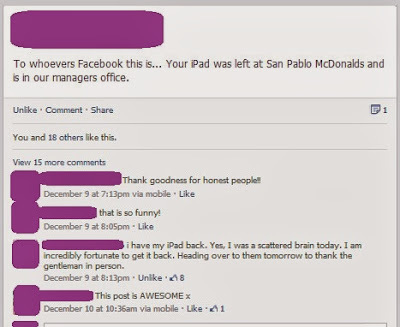 As my friend said on her page, times are tight...he could easily have sold that iPad, but instead did the honest thing. When you are faced with a decision like this, what would you have done? Honestly? I'm always doing "random acts of kindness" and I love to hear about others doing the same thing. So, even with everything else going on...I still believe there are good people in this world. So, everywhere you look, you can find the "Money Saving Challenge". But...what about those people that only get paid once a month? To save something every week is hard. Soooooo...I've come up with my own challenge for this next year. It's a "Reverse 52 Week Money Saving Challenge". 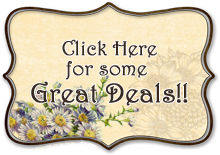 Not only will this help you with the monthly savings, but you can also see more in your savings sooner. So, you can actually feel like you're accomplishing something!! Which for me is a big deal because I like to see results, and I'm kinda impatient. I hope that you take the challenge, and in doing so keep me accountable! I will update as often as possible, but we all know how things happen. So, are you going to take this challenge? Does it seem easier to save like this?